Explanation: Once upon a solstice eve a little prince gazed across a frozen little planet at the edge of a large galaxy. 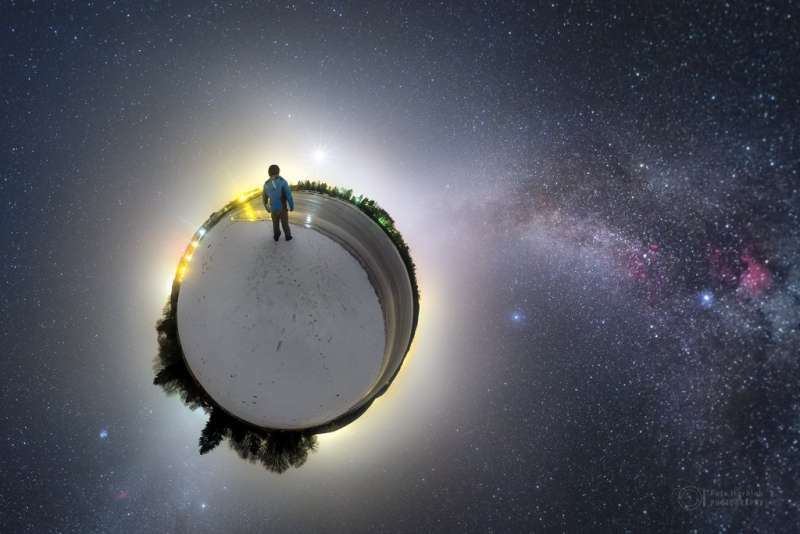 The little planet was planet Earth of course, seen in this horizon to horizon, nadir to zenith projection, a digitally stitched mosaic from the shores of the Sec reservoir in the Czech Republic. So the large galaxy must be the Milky Way, and the brightest beacon on the planet's horizon Venus, visible around the globe as this season's brilliant evening star. Celestial treasures in surrounding dark skies include the Pleiades star cluster, and the North America nebula found along a dusty galactic rift. Embracing Venus, Zodiacal light traces a faint band across the night, but the more colorful pillars of light shine above streets a little closer to home.